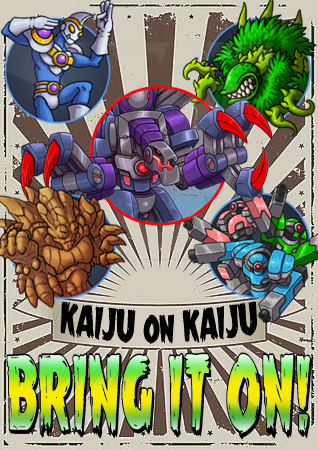 The Kaiju-a-Gogo team consists of seven professional game devs, who between them have over 80 years of cumulative experience in the gaming industry and have contributed to over a dozen shipped titles, most recently Sword of the Stars: The Pit and Ground Pounders. Chris “Degrassi” Gerspacher is the Lead Artist of Kaiju-a-Gogo and one of the founding partners of Kerberos Productions. He has worked in the gaming industry since 2001, and since the founding of the studio he has served as the Art Director and contributed 2D and 3D art assets for all Kerberos titles, in particular the original Sword of the Stars and Sword of the Stars 2, and Sword of the Stars: The Pit. Ken Lee has been working in the gaming industry since 1999 and has been a 2D artist for Kerberos Productions since the founding of the studio in 2004. In addition to his work on Kaiju-a-Gogo, he has contributed the majority of 2D art assets for all Kerberos titles since the founding of the studio, including the original Sword of the Stars and all expansions, Fort Zombie, and Sword of the Stars 2: Lords of Winter, Sword of the Stars: The Pit and Ground Pounders. John Yakimow has been working in the gaming industry since 2005 and joined Kerberos Productions as an artist in 2007. In addition to his work on Kaiju-a-Gogo, he has contributed 2D concept art and 3D assets to the Sword of the Stars series since Born of Blood and later expansions, Sword of the Stars 2: Lords of Winter, and Fort Zombie, and Sword of the Stars: The Pit. James Goldthorpe is a Level 28 Network Wizard! James began his quest at the tender level of 10, where he began casting spells in the mystical language of Basic to make his first text-based RPGs. From then on he launched a merciless grind with little sleep until obtaining the C++ feat, and mastering the dark arcane magics of network engineering. After attending the Guild of Game Development at the Art Institute of Vancouver, he received a party invitation in 2012 from Kerberos Productions. He has since sacrificed many beasts and prayed to foul gods to help give birth to the Sword of the Stars II: End of Flesh expansion and Sword of the Stars: Ground Pounders. In his spare time, James enjoys lifting heavy iron things and placing them back down, when not casting code. Martin E. Cirulis is the Lead Designer of Kaiju-a-Gogo and the CEO of Kerberos Productions. His career in the computer gaming industry spans twenty years, beginning as a professional reviewer for Computer Gaming World magazine in 1994. He worked as Narrative Designer on Homeworld and Ground Control and has since served as Lead Designer on several shipped titles, including Homeworld: Cataclysm, Treasure Planet: Battle at Procyon, the original Sword of the Stars and all of its expansions, Fort Zombie, and Sword of the Stars 2: Lords of Winter, Sword of the Stars: The Pit, and Ground Pounders. Rowan Epp is the Associate Designer for Kaiju-a-Gogo. He joined the Kerberos team in early 2014 to work on Sword of the Stars: Ground Pounders, which is currently nearing release, and is already hard at work on Kaiju-a-Gogo as well. Chris Stewart is the Executive Producer of Kaiju-a-Gogo and the COO of Kerberos Productions. He has been working actively in the computer gaming industry since 1997 and served as a Designer on Homeworld: Cataclysm, Treasure Planet: Battle at Procyon and Bully before becoming a founding partner of Kerberos Productions. He has been the Producer of all Kerberos games since the founding of the studio in 2004.